The Ex caged chickens have done there job in the garden and eaten all the weeds and grass off. The trouble is I now want to get tidying up and planting in there but the nine chickens somewhat stop this. I even tried to keep them out of the fruit section of the garden with a fence but everyday they get through (or over despite having their wings clipped). They need to be moved. So I need to do two things: build a new coop (their current one is an old shed which will fall over if I look at it funny), and put up a fence. For a while I've liked the idea of having some movable netting so every few weeks I can move the chickens onto a fresh bit of grass. Today, armed with a 15% off voucher, my daughter and I went down to countrywide and brought a 50m roll of poultry netting complete with posts. I've already got a fencer unit (well dad has but he's not using it) so that makes it a little cheaper, although at well over a hundred pounds we've got a few eggs to sell to make our money back! It'll be nice to be able to move the chickens onto fresh grass and I'm sure the eggs will benefit, the trouble is I've now got to build a coop fairly quickly. Any ideas for a quick build coop? 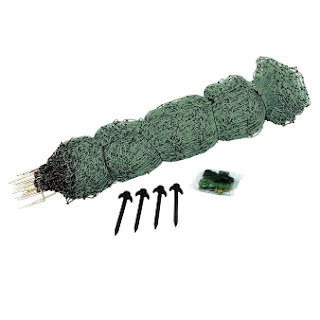 Also does anyone use this netting and if they do is it any good? It is useful, cheap, and movable ( good points) but will deteriorate and fall to pieces in time. You also need to keep the grass short underneath it if you use a transformer. I'm glad you say go for it as I've bought it! I will use a transformer some times (my dads got a few he no longer uses). I hope it doesn't deteriotate too fast as it wasn't that cheap! The veg patch is surrouded by 5 ft electic fence but not live - just to keep them out of it! I was thinking that it would work not live and as I haven't yet built a movable coop, I'm just using it to keep the chickens out of the soft fruit area so they don't eat the budds. In the next could of weeks I'll start using it in the fields. We use it all the time, usually electrified. Our birds have access to a 2 acre paddock so we keep them in around a third of it at a time while the grass recovers in the the other sections. Moving the fencing (we have 2 lots attached together to make the area as large as possible)is a pain but is something we only usually have to do every two months. We have found since having the geese as well (only 3) that the grass suffers a lot more, so maybe in Summer we will move it more often. It seems a big investment when you have to buy it but it does last, ours is now 4 years old and in perfect condition. Thanks Sue at least now with everyones comments I'm thinking I made the right decision. I'm thinking about getting geese in the future but I'll probably keep everything seperate. Sounds like you now have good ideas. I can't help but comment though because I know all about those clipped winged chickens that still manage to make it over the fence!